The heavier end of distortion from the Rat school of dirt - at a lighter price. Variety of distortion tones - crunchy to extreme saturation. Good value. Taking its inspiration from a Pro Co RAT, the Dark Tale's circuitry is based around a LM308 chip, but unlike the RAT's single tone knob, you get separate control over bass and treble. 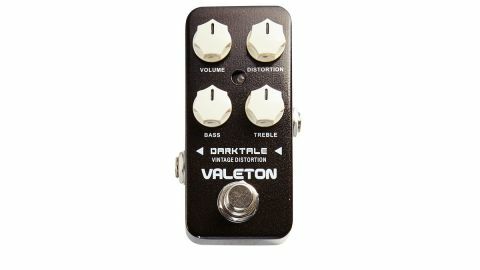 "If anything, the Dark Tale can get more extreme than a RAT"
With the volume up high and the distortion down low, the Dark Tale delivers a crunchy cranked amp overdrive that many would find useful. Advancing the distortion knob adds more harmonically-rich dirt until you get into full-on saturation with loads of sustain, albeit retaining a sharp edge and not getting mushy - definitely in rodent territory. If anything, the Dark Tale can get more extreme than a RAT - where a RAT's Filter knob works on the treble content and retains body, the bass knob here can thin the bottom end for a leaner sound. The Dark Tale is a rodent that delivers big distortion in a small package.